Happy new year my friends. Thank you for a fantastic 2013. I had a blast on the blogosphere and I am looking forward to another fabulous year. I always start the new year with resolutions and I aim to stick to them. My fashion new year resolutions are to have some fun. I tend to take my life a little to seriously sometimes so this year I am going to relax and go with the flow in regards to my life as a fashion and beauty blogger. My posts may not be as regular as before because of my new responsibilities but I will aim to blog as often as I can. Giving my blog a mini makeover as often as I can is also one of my fashion resolutions for this year. I have already given my blog a mini makeover already, changed the header and the blog theme to give it a fresh look, hope you all like it. Finally, I aim to write-up more posts on my personal style. I stopped the personal style feature last year due to unforeseen circumstances but I am coming back with a bang this year so watch this space. So there are my fashion resolutions for 2014. Do you have any fashion resolutions? The stylish Sam Faiers from the hit reality show – The Only Way is Essex (Towie) is wearing a strapless pleated dress from the Love label. What do you think? Yay or Nay? Who wore this Valentino bow bodice dress better? 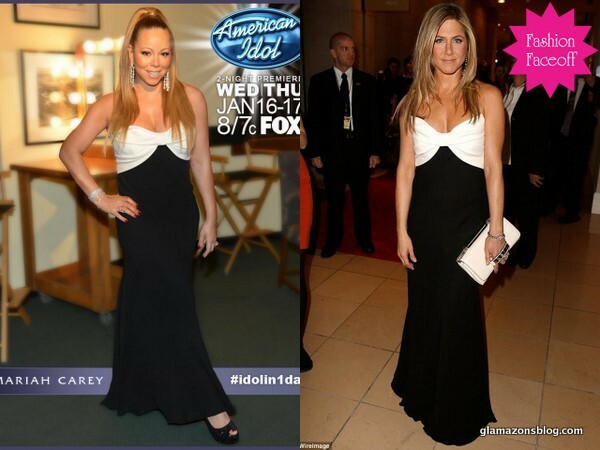 Mariah or Jennifer? Let’s hear it.